LAGOS, Nigeria -- The first Chibok teenager to escape from Boko Haram's Sambisa Forest stronghold was flown to Nigeria's capital, Abuja, where she met the president, even as her freedom adds pressure on the government to do more to rescue 218 other missing girls. Joy and renewed hope have met the discovery of 19-year-old Amina Ali Nkeki, who was 17 when she was abducted, though she appears too traumatized to understand her central role in the tragedy that captured worldwide attention and shone a spotlight on the violent methods of Nigeria's home-grown Islamic extremists. Officials said she met President Muhammadu Buhari at his office Thursday, according to the Reuters news agency. Aid workers say the young woman, who was found with her 4-month-old baby, urgently needs reproductive health services and psychosocial counseling. Hunters found the young woman wandering on the fringes of the remote northeastern forest on Tuesday and reunited her with her mother, family doctor Idriss Danladi said after speaking with the mother. The young woman already has provided valuable information, revealing that some of the Chibok girls have died in captivity and the others continue to be held hostage, according to Danladi. The woman, with her mother and baby were taken to a military camp and flown by helicopter Wednesday to Maiduguri, the biggest city in the northeast that is the birthplace of Boko Haram and the headquarters of Nigeria's war against the extremist group. They were handed over to Borno state Gov. Kashim Shettima, who declared he would in turn hand her to President Muhammadu Buhari "to present to the nation." The woman's uncle confirmed she arrived in Abuja on Thursday for an expected meeting with Buhari later in the day. The young woman probably has not been asked what she wants to do, but aid workers say she likely is a victim of sexual assault. Hostages who escaped have said Boko Haram forces victims to convert, to marry and to copulate "to create a new generation" of extremists. 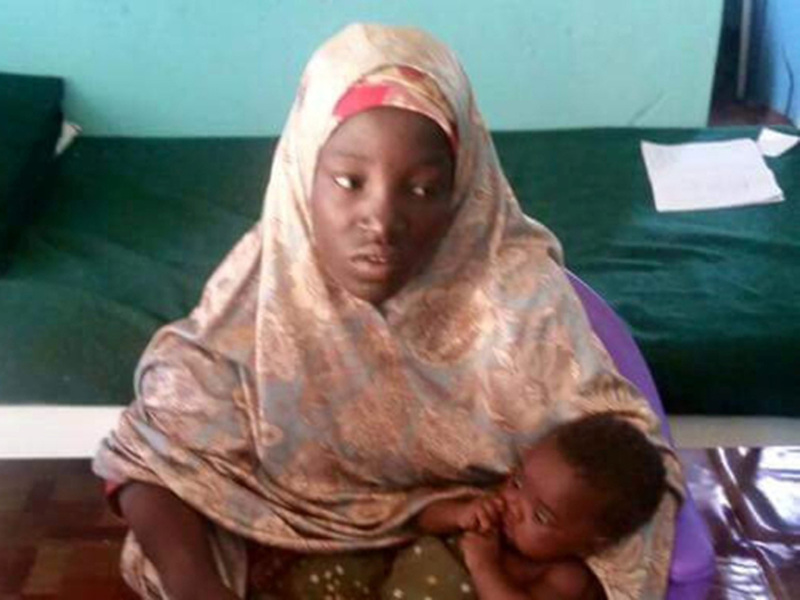 The teenager and her baby on Wednesday "were examined at Air Force medical facility and were found to be stable and normal blood pressure was observed," said army spokesman Col. Usman Kukasheka Usman. "Thereafter, she was released to the (military's) Operation Lafiya Dole headquarters for further investigation and handing over." Her escape highlights the failure of two Nigerian governments and the military to rescue the girls snatched from a government boarding school in the town of Chibok the night of April 14, 2014. The schoolgirls have not been found, despite the help of drones, hostage negotiators and intelligence officers sent by the United States, France and Britain. That failure is partly to blame for the electoral defeat last year of former President Goodluck Jonathan, who was seen as uncaring of their plight and uncommitted to rescuing them. President Muhammadu Buhari earlier this month told CNN he has not seen a proof-of-life video that Boko Haram sent to the government months ago in a bid to open negotiations. It was the first indication in two years that some of the girls are alive. Aid workers warn that escaping Boko Haram does not mean an end to trauma. Former captives, especially often-pregnant victims or teen-aged mothers, frequently are ostracized by their peers and taunted as "Boko Haram wives." UNICEF spokeswoman Helene Sandbu Ryeng said other escapees from Boko Haram "often face mistrust, stigma and rejection when they return to their communities." The treatment of thousands of other rescued or escaped Boko Haram hostages who are further distressed by military detention has been condemned by Refugees International. "Boko Haram abductees are frequently and arbitrarily detained," said the Washington-based organization's spokeswoman, Alyssa Eisenstein. "Previous girls have been taken to Giwa military barracks, where they were interrogated, treated with suspicion and fear, and had no access to medical services." Amnesty International this month called Giwa barracks, in Maiduguri, "a place of death" where babies and children are among scores of people dying from disease, hunger, dehydration and gunshot wounds. Nigeria's military denied the allegations, calling them "a surprise and shock because the organization has accessed the facilities and made recommendations which were implemented." Amnesty denied the military's statement, saying it was "completely false" and that the rights organization has never been allowed to inspect the barracks.